In their first regular season home game as defending Super Bowl champions, the Philadelphia Eagles saw their fans use 10.86 terabytes of Wi-Fi data at Lincoln Financial Field, the third-largest single-day total of Wi-Fi usage, trailing only the last two Super Bowls. 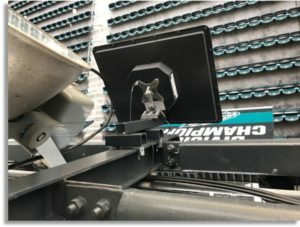 According to figures provided to Mobile Sports Report by the Eagles, an eye-opening 47,274 unique devices connected to the network at some point during the Eagles’ 18-12 victory over the Atlanta Falcons on Sept. 6, out of 69,696 in announced attendance. 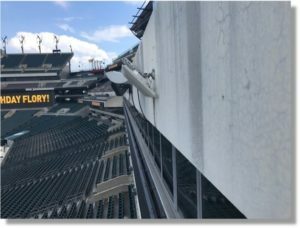 John Pawling, the Eagles’ vice president for information technology, also said the Eagles saw a peak concurrent connection of 36,829 devices on the Wi-Fi network, traffic that at one point “briefly maxed out” the Comcast-provided 10 Gbps backbone pipe that supports the stadium’s Wi-Fi network. 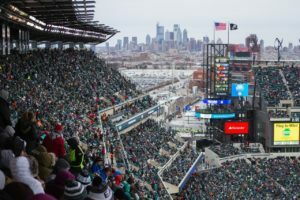 Since the night game was the NFL season opener and included the Eagles’ Super Bowl celebration ceremonies, Pawling expected a high amount of network traffic — they did, after all, see 8.76 TB of Wi-Fi used at the NFC Championship game back in January — but admitted the end result left him and his team “somewhat surprised.” One element that might have contributed to additional traffic was a pregame weather delay, time most likely spent online as fans waited for action to commence. 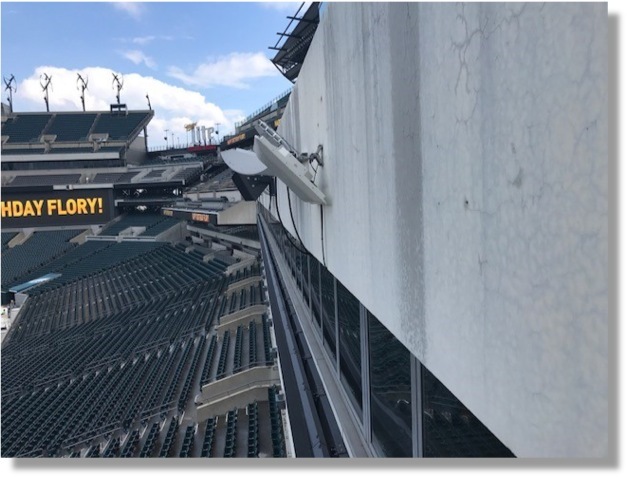 The Sept. 6 game marked the start of the second full year for Lincoln Financial Field’s new Wi-Fi network, which uses gear from Everest Networks, a Silicon Valley startup company that was seed-funded by Panasonic, which acted as the exclusive distribution partner until earlier this year when Panasonic relinquished sole distribution rights to the Everest gear. While Pawling said that the business of Everest leaving Panasonic caused “a little concern” last year, he said that from a technical perspective the Eagles “are dealing with the same people” at Everest as they did at Panasonic, and that there have been no issues that affected the network’s performance. Pawling said that the Eagles chose Everest a couple years ago during what he called a standard refresh review. Previously, the Eagles had used Extreme Networks gear for a Wi-Fi network put in place in 2013. “We tend to look at 5 years as a technology’s horizon, and it was time to evaluate what was in the marketplace,” said Pawling. With its new design that puts four radios into a single AP and new antenna technology that theoretically has a farther reach than older equipment, the Panasonic/Everest gear won the Eagles’ bid. “It’s a plus, absolutely,” to have three radios in each AP, Pawling said, citing the reduced time needed to deploy fewer APs. While the NFL opener now joins the top three in our unofficial list of top Wi-Fi events, we expect this list to change rapidly this year as it seems like the surge in mobile bandwidth demands at big events is still increasing rapidly. We can only imagine what might happen if Taylor Swift plays a halftime show at a big football game, but we can guess it would be a workout for any network currently in place.